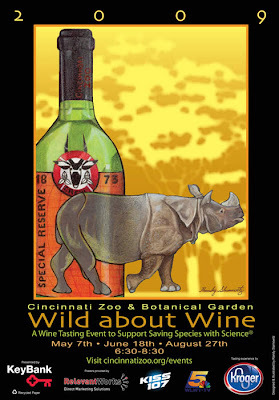 The Cincinnati Zoo will be hosting Wild About Wine on Thursday, August 27 from 6:30pm to 8:30pm. This is the fourth year for the wine tasting event that benefits the Lindner Center for Conservation and Research of Endangered Wildlife (CREW). The theme for this tasting is wine from down under and will feature eight different Australian wines (see full list below). What will be new for the August wine tasting is that the Zoo will host the event at their new Vine Street Village and will include the Elephant Reserve and Giraffe Ridge according to event organizers. In addition to the wine, there will be light appetizers from Habanero, Smokey Bones Bar & FIre Grill, Tano Catering, Truffles from Nordstrom, Innovations Catering and more. A silent auction will also be held and there will be live music from No Name Band and Loop Man Dan. You can purchase tickets now which cost $25 in advance and $30 the day of the event (prices include parking). Those looking to take on the designated driver role can purchase tickets the day of the event for just $15. The Cincinnati Zoo is also well-served by Queen City Metro's #1, #46 and #78 routes - plan your trip with Metro. Are there discounts for Zoo members by any chance? No, Zoo members do not receive a discount. Only designated drivers. METRO should have negotiated a discount thing, too. Loop Man Dan rocks! Australian wine Yum!